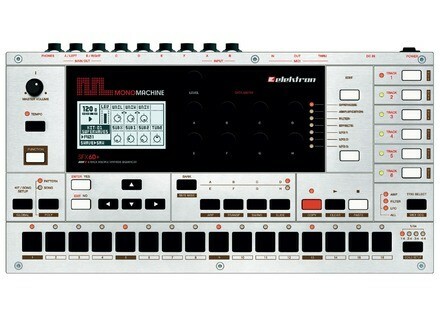 Monomachine SFX60+ MKII, Groove Machine from Elektron in the Monomachine series. A good device. Honestly, it’s great! You could just pass it by if you were to just try it too quickly, but it has an incredible potential. I use it to make small loops, to write things I think of on the spur of the moment. It’s the very first “composing” machine that I’ve owned, and it suits me perfectly (I’d already tried with a computer before, but making music using a mouse and keyboard just isn’t my thing). I intend to use it for a live set soon, but nothing precisely planned yet so far. One thing is for sure: it will perfectly find its place in a live setup. Design is flawless: it’s sturdy, you could pogo on it and it barely would feel it (it’s just a figure of speech – but you can try if you feel like it). Seriously, the aluminium front seems reliable, the control buttons seem unbreakable and the machine itself is a very sturdy metal block. The sole problem comes from the knobs which may end up moving in an undesirable manner, but nothing too bad. Soundwise, the device unveils itself as a first-class synth. It has a sound of its own, which may seem quite repetitive in the beginning (I must admit that I first started to wonder why I’d bought it), but once you get familiar with it its capacities appear endless, from beautiful, long pads to tech-like aggressiveness. 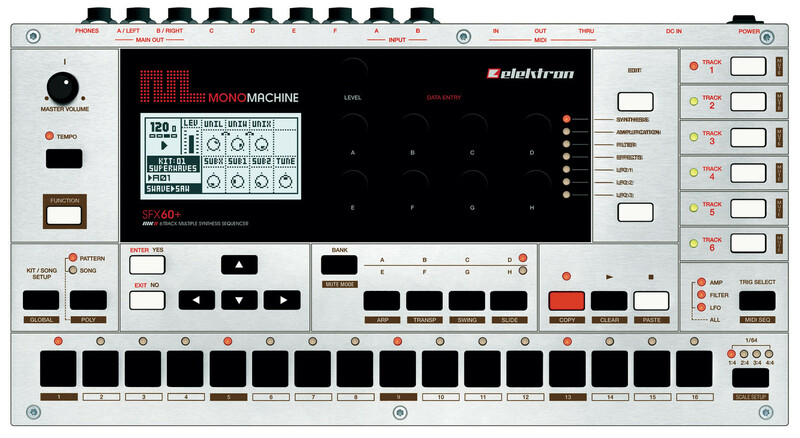 The principle behind the Elektron “machines” – with one machine corresponding to one given type of synthesis – is very simple to understand once you got it. As stated earlier, some machines sound very much alike, but they reveal their interest once you’ve started to tweak the sound: yes, there are a lot of possibilities for modifying the sounds and they’re really interesting, including Sample Rate Reducer, single-band EQ, delay, VCA, filter and envelopp, disto, 3 LFOs – and this goes for each track! Needless to say there’s room for experimentation: I’ll leave you calculate how many possible combinations this offers, considering that the device allows to layer up to 6 tracks simultaneously. It’s also particularly interesting for external synth sequencing (it’s basically one of the things it was designed for btw): it can control up to 6 synths at once, which is quite practical (and really, really great). While I have explored this aspect very little so far, I have tried a bit external sequencing and it’s incredibly easy. Just a word on the onboard sequencer: it’s somehow the core of the machine, as it has a major role in the sound design process. The “parameters-locks” allow to modify the patch thoroughly for one precise given step, all while featuring easy copy/paste features to copy songs, patches or full tracks and paste them for other uses. In the end of the day, the balance sheet is easy: if you have the opportunity to use one for long enough, go ahead and do it! Now yeah, granted, the learning curve can be relatively long, and one of the reasons for that is the interface which at first may seem terribly complex. However, once you get used to it, it appears logical and user-friendly (yes, I swear it does! ), yet it clearly seems intimidating at first. Something I regret is the fact you can “only” use 64 steps: sometimes it’s well enough, but sometimes it’s not. Now, you can’t always get what you want, and you still can chain two patterns to turn them into a longer pattern. Anyway, at first, you’re bound to have a hard time, finding a precise feature will take you hours (reading the manual is vividly recommended, especially considering how comprehensive and pleasant to read it is), you’ll feel like the sounds resemble each other too much and that you always end up doing the same thing, and you’ll get fed up with it; then, slowly, its capacities will appear clearly and you’ll feel that you can’t live without it. Because it allows crazy sounds (just have a look online, there are so many examples), because it’s very user-friendly once the learning curve absorbed, because it’s an exceptional device, and because it has no direct competitor, being in a league of its own. Of course, you’ll have to like the sounds it creates. But if you like the demos you’ll come across, then it’s very likely that you’ll like the machine too!